Postscript about the difficulties of translating haiku. 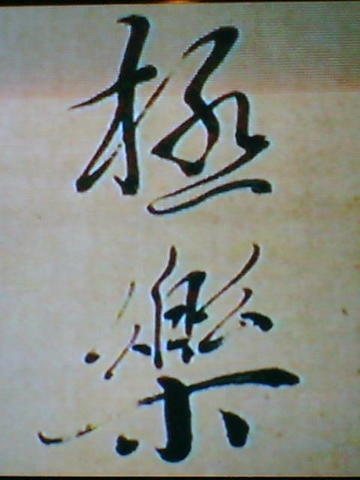 On a TV program of NHK the other day, I learned that Kumarajiva, the Great Translator, one of my favorite senpai, an elder collegue so to speak,was the one who "invented" the combination of the Chinese characters to express paradise, gokuraku　極楽, which is part of the name of my home, the Paradise Hermitage, GokuRakuAn. GOKU means "number one", a place where it is best to relax and feel safe. But let me introduce this famous translator first. 344-413, Buddhist scholar and missionary, born in Kucha (龜茲) , in what is now Xinjiang, China. When his mother, a Kuchean princess, became a nun, he followed her into monastic life at the age of seven. He grew up in centers of Hinayana Buddhism, but he was converted to Mahayana Buddhism in his teens and became a specialist in Madhyamika philosophy. In 383, Chinese forces seized Kucha and carried Kumarajiva off to China. From 401 he was at the Ch'in court in the capital Chang'an (the modern Xi'an), where he taught and translated Buddhist scriptures into Chinese. More than 100 translations are attributed to him. Of these only about 24 can be authenticated, but they include some of the most important titles in the Chinese Buddhist canon. Kumarajiva's career had an epoch-making influence on Chinese Buddhist thought, not only because he made available important texts that were previously unknown, but also because he did much to clarify Buddhist terminology and philosophical concepts. He and his disciples established the Chinese branch of the Madhyamika, known as the San-lun, or "Three Treatises school." He was very much responsible for transmitting Buddhist thought and philosophy along the ancient Silk Road. If he did not find suitable terms, he began to make up words using combinations of Chinese characters to fit his image. He discussed with more than hundred Chinese students until they found a suitable solution to a concept. "Translating a Buddhist text is like chewing a meal first and then spitting it out. The reader will only have your chow and if you are not careful, the best meal will turn into poison in his culture." How very right he is! Though the Buddhist scriptures are great treasures, it cannot be benefited to the people in China if they are not translated in Chinese. Moreover, if they were translated in deviation to the Buddha’s true teaching, the adverse effect to the learners and practictioners was detrimental. Thus, the translators must be talented scholars with excellent knowledge in Buddhism, fluency in writing and proficiency in Sanskrit and Chinese, etc. The status of translators in Buddhism is comparable to many great Dharma masters, which is remarkable in history. In summary, around 6000-7000 fascicles of the sutras were transmitted to China and translated in Chinese during 2nd century and 13th century. There were almost 200 prominent translators during those years. Amongst them, Kumarajiva was the most prominent one in the early years (i.e. at 5th century), while Hsuan-tsang was another one in later years (i.e. at mid 7th century). Read more details at the link provided below. Here is just an interesting part on the Translation issue. Eventually, 16 years after the death of Tao-an, Kumarajiva arrived at Chang-an (長安) and was welcomed by the King Yao Hsing (姚興) in 401 A.D. Kumarajiva was already over fifty at that time. 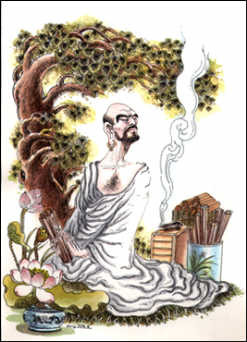 Yao Hsing honored Kumarajiva with the title of National Preceptor, and asked him to be in charge of translating sutras in Chinese. Many followers of Tao-an gathered around Kumarajiva to learn the profound teachings of Buddhism. In return, they helped Kumarajiva with his translations. Kumarajiva was highly respected. The King Yao Hsing had provided him and his colleagues with large buildings where they could work together in translating sutras. The King himself sometimes participated the works as well. Before Kumarajiva died, he proclaimed that if his translation was in accord with the genuine principles of Buddhism, his tongue would be intact and not turn to ash.. After incineration of his body, the tongue was not damaged. Kumarajivas translations eventually reached Japan with the distribution of Buddhism in this country. The famous quote of the Heart Sutra, (般若心経) chanted in all Buddhist Sects, was also first introduced by Kumarajiva. The Every-Day Distractions itself are the true Place of Religious Practise. Your real practise starts when you leave the doojoo (place for training 道場). You daily life must be your place of practise with the invisible bow and arrow. More about BONNO, worldly desires and Haiku. The earliest translators had some difficulty in finding the exact words to explain Buddhist concepts in Chinese, so they made use of Taoist terms in their translations. As a result, people began to relate Buddhism with the existing Taoist tradition. It was only later on that the Chinese came to understand fully the teachings of the Buddha. As pointed out by Conze, Kumarajiva's translation of the sutra into Chinese, by far the earliest version (c. 400 CE) of the Heart Sutra that we possess, is extremely important in tracing out the argument of the sutra as it would have appeared to its original compilers. Translating haiku or reading the translations of others is constantly reminding me of the great rersponsibility of a translator. One word with a wrong nuance and many people who live only on the chow of translators only will get the wrong impression. Basho himself did not make up a poetical metaphor reading "the river in the sky, the heavenly river, Heaven's River" or something to that effect, he simply used the word common in everyday Japanese language to describe this heavenly phenomenon, with the simple English equivalent of "Milky Way". This haiku is therefore not suited to support the theory that Basho used his own metaphor in his haiku. In this one Basho did not, only his translator made it look like so, in my opinion. gyuunyuu no michi　牛乳の道? Milky Way ? Let me quote another example that was discussed in the WHCworkshop. It was given as an example to support the theory that Issa wrote one-sentence haiku. Did Issa write a one sentence poem or did the translator, Ueda Makoto ? On the following link you find an essay about the translations of works of Basho, starting with an interesting presentation of the Oku no Hosomichi. Reading a translation sometimes reminds me of reading a recipie for a meal. You get all the ingredients and cooking instructions and so on, maybe even your mouth will water at all these delicacies and exotica, but you will always be hungry, becuase you never get the real thing. Especially if the real thing has only 17 beats, it is most difficult to transmit all the deep meaning hidden in kigo, kireji and other devices into a foreign language and a different culture with completely different concepts at times. thinking of Kumarajiva in times of language despair. You open many doors... a pleasant breeze. Thank you Chibi san ! Example for a WRONG translation. Read a discussion about the translation of this haiku.
. Translating Haiku, by Gabi Greve .